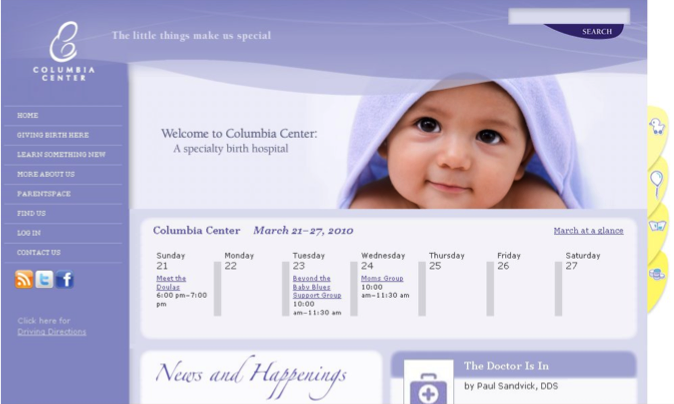 In 2009, Creatonomy helped Columbia Center design and imple­ment an updat­ed web­site that built upon the organization’s strengths. Columbia Center’s tagline is “When you’re expect­ing ... more.” The inti­mate bou­tique-style birth hos­pi­tal wants that expe­ri­ence of “more” to begin from the first encounter poten­tial patients have with Columbia Center, and increas­ing­ly that first encounter is through its web­site. Creatonomy designed Columbia Center’s new web­site with moth­ers in mind, sig­nif­i­cant­ly increas­ing both rel­e­vant con­tent and oppor­tu­ni­ties for inter­ac­tion. Moms seem to like the changes — in the first six months fol­low­ing launch, site usage increased by over 700% over the old web­site design. This sample originally was published to portfolio.kevinabarnes.com on March 2, 2010.